The Melvale Distillery, maker of Melvale Rye Whiskey, was located in the Jones Falls section of Baltimore by John T. Cummings in the 1880s. One of the original buildings remains intact, although the site no longer distills alcohol. 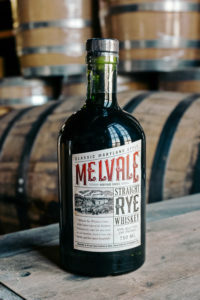 Melvale Pure Rye was one of the most premium of the pre-prohibition Maryland Ryes. In its day, the Melvale brand became one of the most prestigious and respected of Maryland’s rye whiskeys. Our Melvale Straight Rye’s mash bill is 51% rye and 49% malted barley to capture the bright and grassy flavor and softer finish of the old Maryland rye brands. It’s aged three years in new American oak barrels and hand bottled at 90 proof. This medium body spirit is true to its roots, with a great balance between the initial sweetness, muted rye spiciness and oak influence both on the nose and in the initial sip. It starts with honey and vanilla notes but finishes with a softened note of rye spice and a taste of cinnamon, pepper, and sweet honey.